A concrete pool deck is a common choice among homeowners. Not only is concrete a reliable material, it is affordable and versatile, too. However, it is not the most appealing of pool deck materials, isn’t it? That is where its versatility will play a huge role. There are many ways to enhance a concrete pool deck. One is adding color. 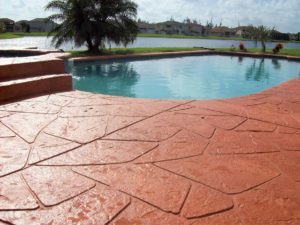 Just recently, colored concrete pool deck ideas has become so popular. There are so many pool deck refinishing methods available to help enhance its appearance. Now, you can opt to stain, paint, or dye your deck in your desired color. But what are the benefits of a colored pool deck? If your pool deck looks exactly like that of your neighbor’s, what’s the surprise in that? Having a unique look is a good thing. Adding color to your deck will definitely make it more recognizable and memorable. A pool area surrounded by nature can be enhanced to blend in well with the natural setting. You can choose to incorporate earthy tones like browns, reds, and greens. If you could, try a stamped pool deck resurfacing project where the deck acquires a natural stone pattern before being hand-stained to mimic real stone. Adding colors in lighter shades is a great way of increasing heat reflectivity. Light colors reflect heat back while dark colors absorb heat. This means that, with a light color, your concrete pool deck could stay 30% cooler to the touch than other paving materials. Coloring agents, like concrete stains, can effectively cover up ugly stains and discolored concrete surfaces. You get to save yourself from having to do tedious work, like scrubbing, just to get stains out. Concrete also has the natural tendency to discolor to a brownish color instead of gray. You can correct this and even out the appearance with color. Have you ever walked into a yellow room and felt immediately happy? Color has that effect. Warm colors like yellow, red, and orange induce feelings of happiness and optimism. This is why most fast food restaurants use these colors. Cool colors, like blue, purple, and green, help make you feel cooler, calmer, more relaxed, and sometimes more creative. Whatever color makes you feel good is the best option for you.